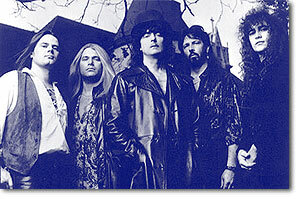 After his departure from Deep Purple, Ritchie Blackmore spent the first half of 1994 assembling a new band. To avoid comparison with earlier line-ups of Rainbow he wanted to use the name Rainbow Moon, until record company pressure forced him to reanimate Rainbow. The band included Scottish singer Doogie White, and American musicians Paul Morris (ex-Warlock), and John O'Reilly (ex Joe Lynn Turner band). Bassist Rob de Martino (ex Virgin Steele), was replaced by Greg Smith (ex Alice Cooper and Joe Lynn Turner) after the first rehearsals.The group wrote and rehearsed extensively towards the end of 1994 in America, then cut the album "Stranger In Us All" in January 1995 in New England, to be released in September at the start of the world tour. The album received a mixed fan reaction, but sold well in some territories (particularly Scandinavia and Japan). Just before the supporting tour John O'Reilly injured himself during a football match, and was quickly replaced by Chuck Burgi from Mk 8 Rainbow. O'Reilly later re-surfaced (briefly) with Blackmore's Night. This line-up kicked off the tour in Helsinki, Finland, on September 30th 1995. European shows recorded included Stockholm for Swedish radio and Dusseldorf for German TV. The gigging went on through 1996, albeit at a slower pace than had been the case first time around, and included a trip to South America followed by a second lap around Europe. Rainbow's previous manager Bruce Payne had stayed with Deep Purple, and Rainbow were handled by a new agency, though increasingly Ritchie Blackmore's girlfriend's mother began to take on a management role. Burgi left the band at the end of 1996 for a more financially rewarding gig with Enrique Iglesias, and was replaced by another American, John Micelli, who had worked with Meatloaf. The group now set off on a low-key American tour, and the new album was finally issued there. The shows in February / March 1997 proved to be their last. Blackmore had already talked about doing a proper solo album in partnership with Candice Night (who had helped write some of the "Stranger In Us All" songs), and the plan had been to finish that then reconvene Rainbow. The band played their last show at a festival in Esbjerg,Denmark on May 31st 1997. The rest of the band were offered 'retaining contracts' by Blackmore's new manager but with no clear future they declined, and Blackmore released his first Blackmore's Night album in April 1997. Aside from the German b-side and Japanese edition of 'Stranger In Us All' with its bonus track, that's it really!